I have to confess, I’ve been dreading making this dish. 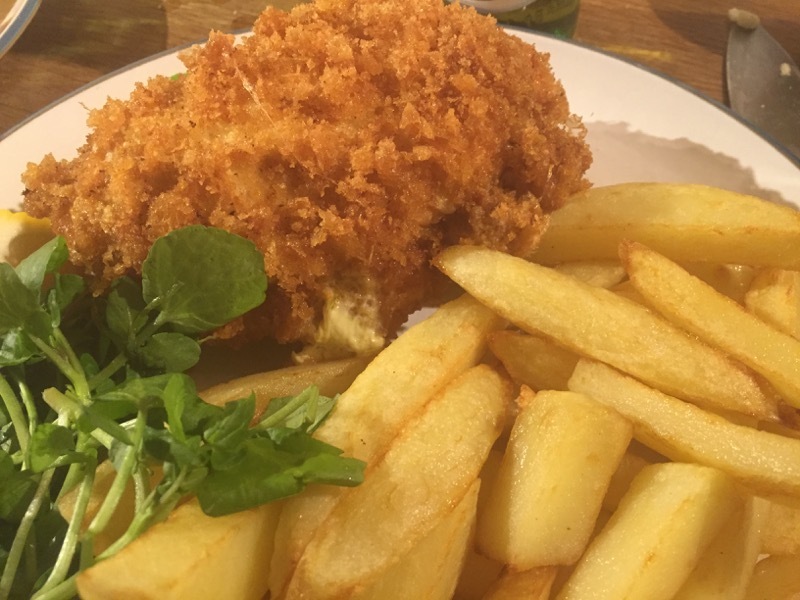 It’s not that I don’t like Chicken Kiev – I do – it’s more the thought of all the things that could go horribly wrong with it. I mean, how on earth do you stop all that butter leaking out? Surely, it’s just not possible. Many’s the time over the years I’ve looked at this recipe in the book, and then wimped out and closed the book again. Well, it’s finally time to set aside my fears and see if I can actually make it. 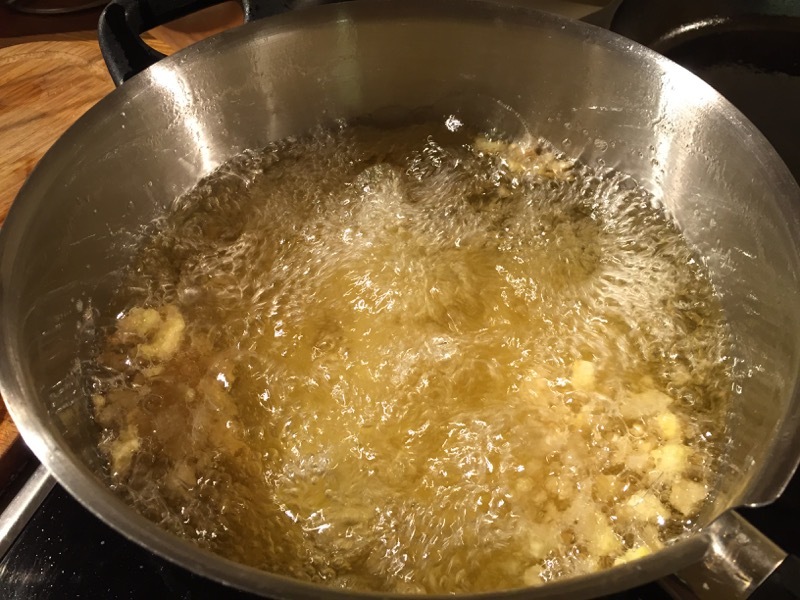 First step: make the garlic and herb butter. 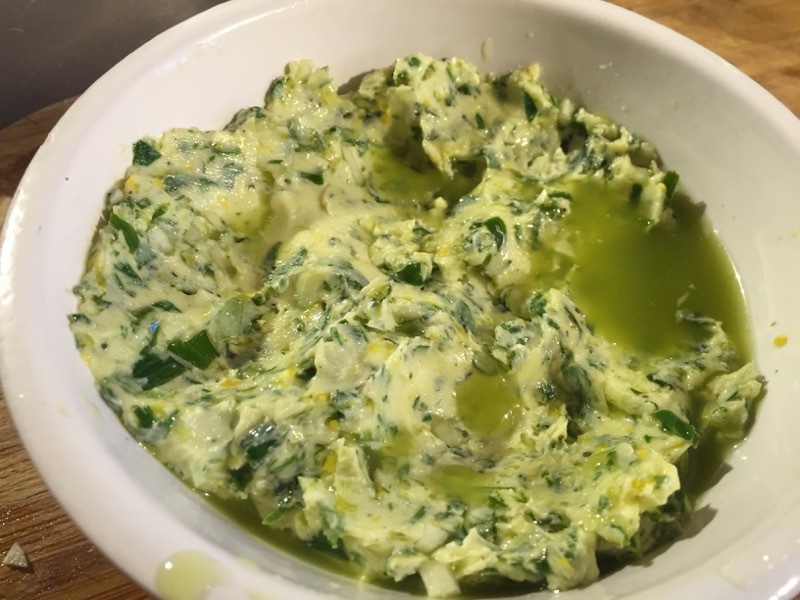 I blend butter, garlic, parsley, tarragon, chives, lemon and tabasco together. After adding a dash of Pernod and some salt and pepper, it’s done. I can’t help but taste a bit – it’s absolutely delicious! I put it to one side to firm up a little. Now for the chicken. 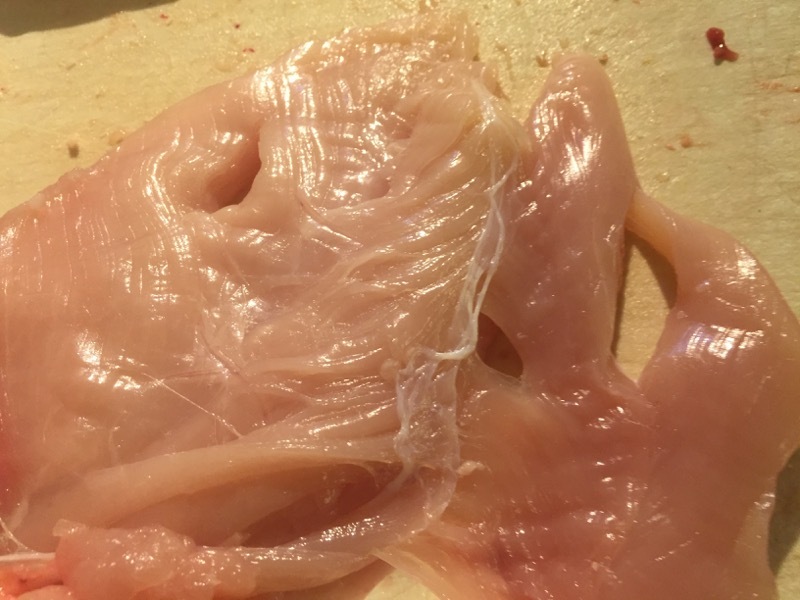 The recipe calls for “chicken breasts, skinned with their little wing bones still attached.” Well, I figure the easiest way to do that is to start with a whole chicken and joint it myself. I start by slicing down the back to open it up. As I do this my knife slips and the point hits the inside of the chest cavity. I’m sure it’s only a little nick, it’ll be fine. So, I continue, removing the legs, then the breasts. They don’t look too bad. I look a little more closely at the breast that I nicked with the knife point. I realise that the hole is a bit more substantial than I thought – the knife point had clearly gone right through and came out the other side. I open up the fillet, and it looks more like a lace doily than a chicken fillet. There’s no way that is going to hold a pocket of butter without leaking. 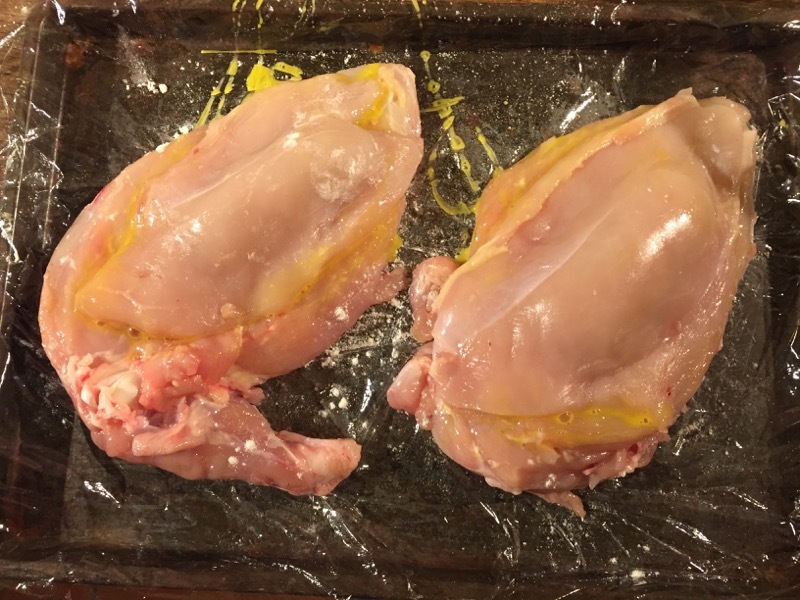 I can’t believe I did that – I’ve jointed hundreds of chickens over the years, and I don’t think I’ve ever punctured the breast like that before. I have no option. I abort. Looks like we’re not having Chicken Kiev tonight. Instead, I cover the legs with a mix of spices, roast them in the oven and serve with some garlic and onion rice. Tasty, it was; Chicken Kiev, it wasn’t. The next day, I nip into town and buy another chicken. Thinking about the previous evening’s disaster, I also pick up a pack of two small chicken breasts – these would be my insurance policy. When I go to remove it from the fridge, I see that I had somehow left it slumped at an angle with the breast touching the back wall of the fridge. That part of the breast was now frozen solid. Great. I leave it a little while to defrost, but when I come to joint it, it’s still pretty hard. This recipe is doomed, I can just tell. I plough on. I joint the chicken, and finally manage to pry the still frozen breasts off the carcass. Wait? Where’s the wing bone? One of the breasts is missing the wing bone! I had been very careful to retain those, but suddenly it’s not there. I guess that during the wrestling match with this hunk of ice, I’d inadvertantly cut it off. Oh well, it’s not terminal. I would have the maimed one, Sue could have the intact breast. 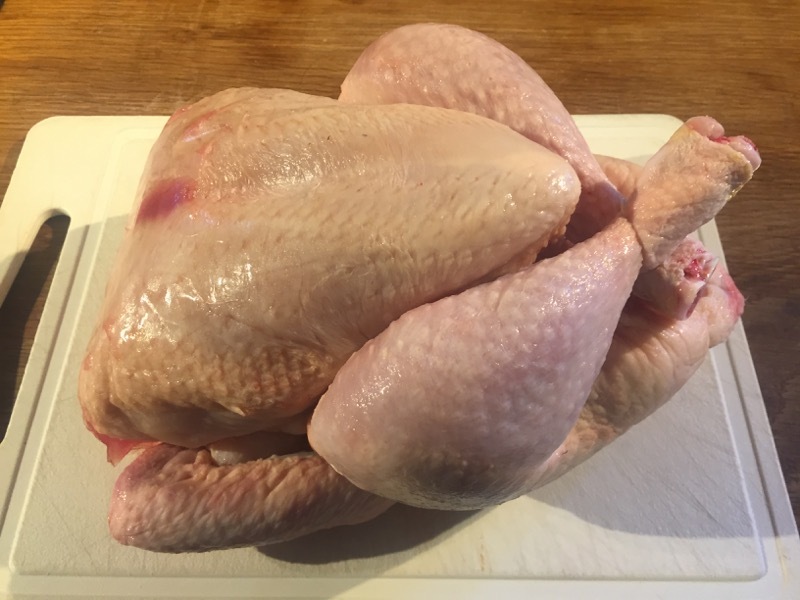 I realise that these breasts are quite large. Perhaps I should have bought a smaller chicken. However this works out, I don’t think we’re going hungry tonight. 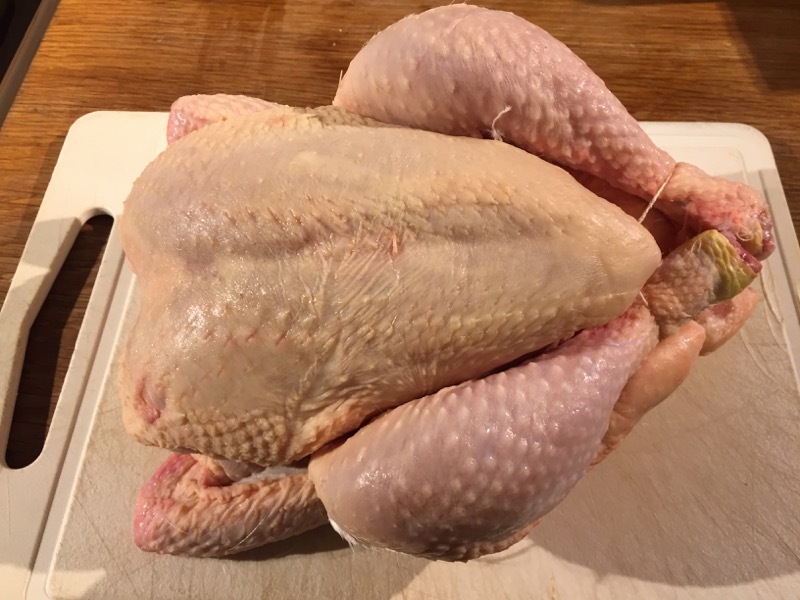 Now, the idea here is that the flap on the bottom side of the breast, the fillet, is removed, beaten flat, and used to sandwich the butter to the rest of the breast. 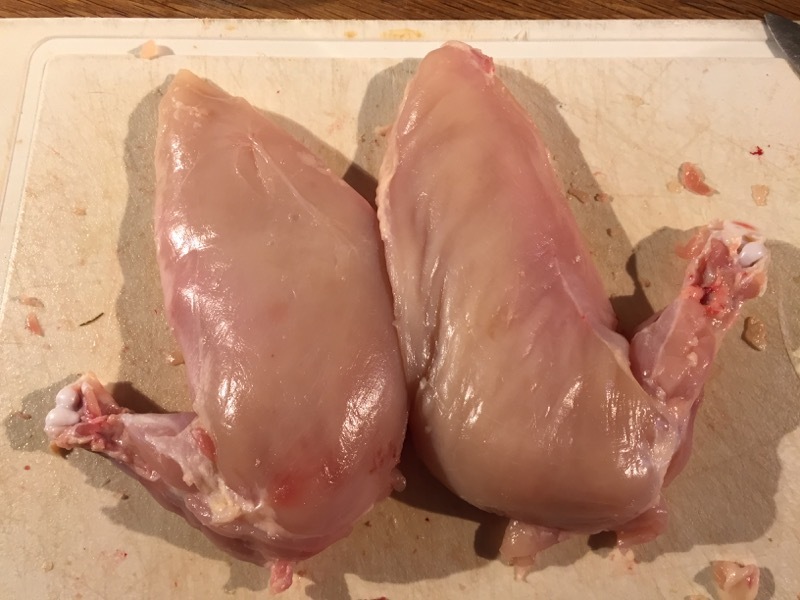 Now, despite the vast size of these breasts, both fillets here looked pretty small. One was possibly up to the task, but the other had no chance. Luckily, I had bought an insurance policy earlier in the day. 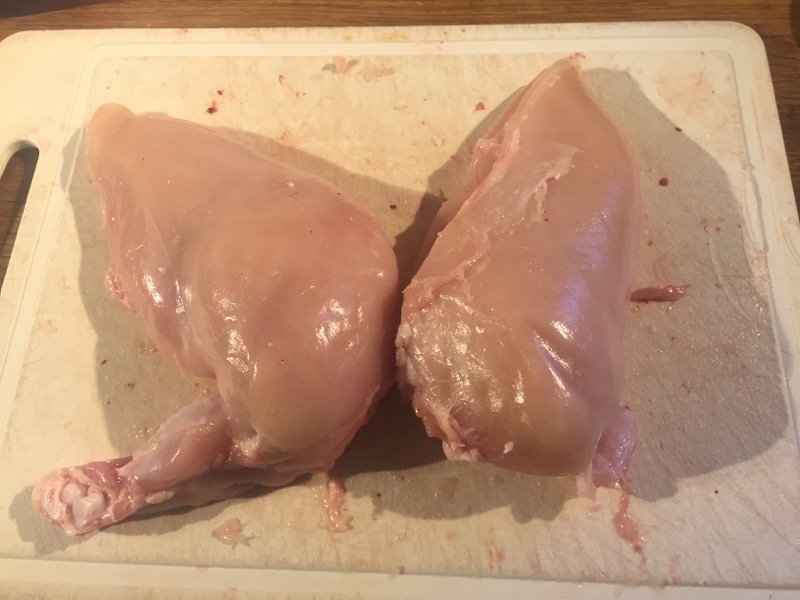 The two spare chicken breasts I bought earlier were tiny – barely larger than a large fillet themselves – they would work beautifully as surrogate fillets here. 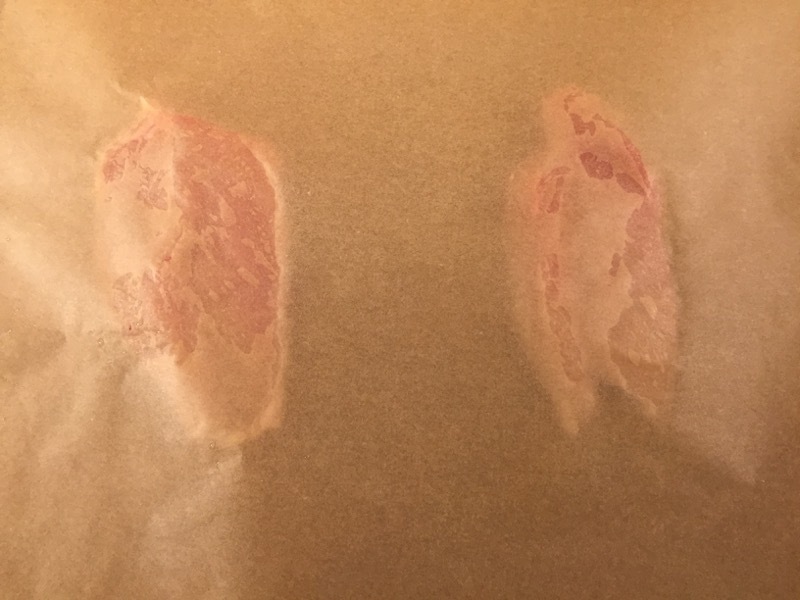 I removed the fillets from both sets of breasts, placed the breasts between two sheets of baking parchment and then proceeded to flatten them all with a steak hammer. 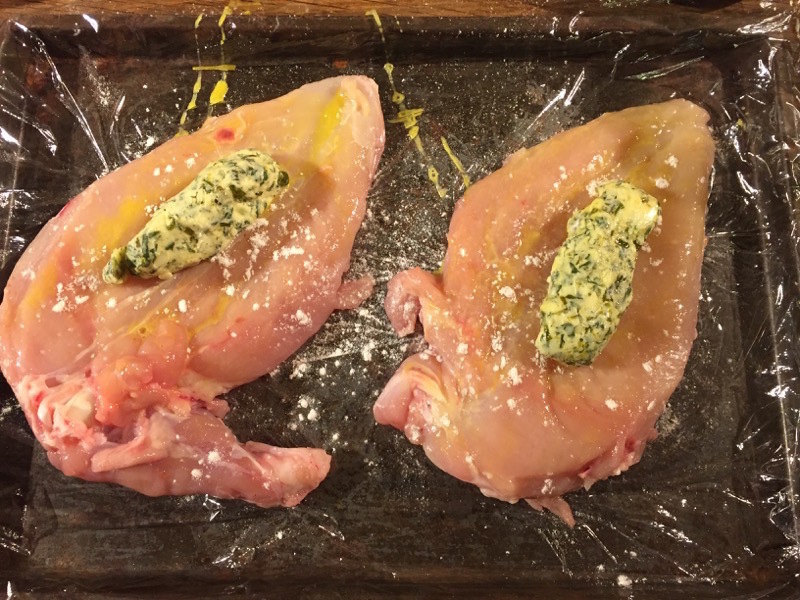 I lined a baking tray with cling-film, and lay the larger breast on it. I brushed the insides with beaten egg, dusted with a little flour, and place a sausage-shaped piece of yesterday’s garlic butter in the centre of it. I topped each with one of the smaller breasts, similarly egged and floured, and pressed down around the edges to seal. Finally, another sheet of cling film goes over the top, and the tray goes into the freezer for a short while. When it’s time to cook, I remove the breasts from the freezer and dip them in flour, beaten egg and then breadcrumbs, taking great care to fill all the little crevices. 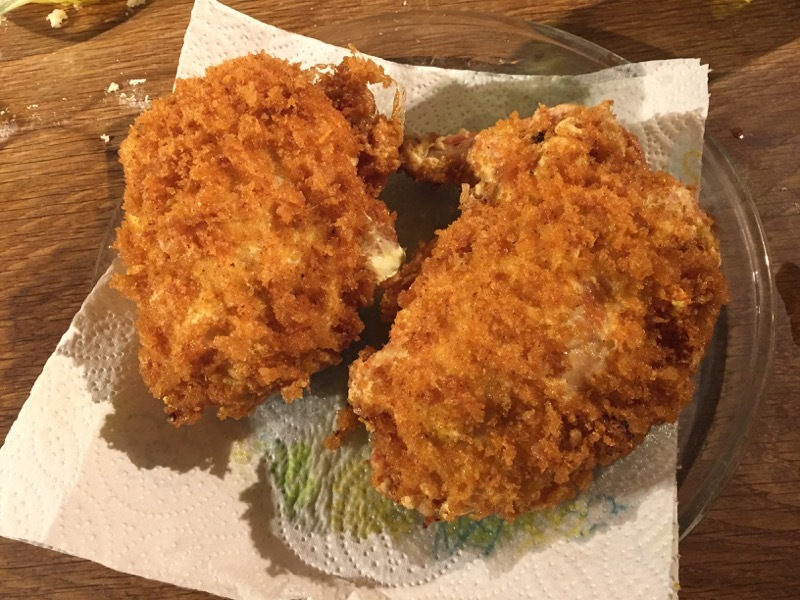 I place them gently in the deep fryer and cook for about ten minutes – that’s a little longer than the time in the recipe, but I figure these breasts are probably a little larger than average. Once done, I take them out and let them drain. They look good. There’s a small pocket of white on one of them, where a little butter has leaked, but it looks like the milk solids in the butter have set solid in the hot fat, sealing up the hole quite neatly. I served them, as suggested, with chips, lemon quarters and watercress. They were fabulous. Beautifully crisp on the outside; tender, moist chicken on the inside; and a pool of delicious garlicky-herby molten butter within. But boy were they large. I’m afraid I couldn’t eat the whole thing. I desperately wanted to – it was so, so good – but I felt I was likely to explode if I tried. I’d been putting off making this for so long, I really should have tried it sooner. I was very pleased with the way this turned out. I will certainly make this again. Well this is more like it! I’ll take Chicken Kiev over liver and onions anytime anyone cares to make it for me. I have to say that I’ve not had many Chicken Kiev meals in my life. It’s something that has too much potential for not being very nice so I’ve avoided it except in one or two places. But this was way better than any I’ve had before. For a start is seemed to be near enough half a chicken (I still have left-overs for a lunch) and whereas I had expected more or less garlic butter and no other flavour, this one was deliciously lemony as well as garlic and herby. The lemon made it. Also, Dave had got his breadcrumb just perfect. Light and bright and crisp and it didn’t shatter off as we cut into it. It came served with chips and watercress. I felt the watercress was rather an odd accompaniment because it’s rather sharp and metallic tasting. I do like it, but probably not with chips. However, it was green so I was a good girl and ate it. Dave’s chips are always really good, so the whole meal was a great success. The Kiev was excellent. I’ll be hoping for that again at some point. Looks like an epic feast, love a good Kiev 🙂 nice work!